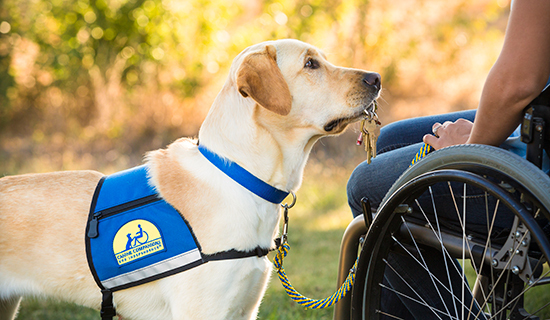 Become familiar with the current American with Disabilities Act (ADA) law around service animals. It is important to know that disabilities are not always visible and legitimate service dogs come in all breeds and sizes. We do not recommend approaching a stranger with a potentially fraudulent service dog. When untrained pets posing as service dogs behave badly, people who truly need assistance dogs can face added discrimination and lose access to public places--both violations of the Americans with Disabilities Act. It's a devastating problem for people like Peter Morgan, who can't bend over without pain because of a spinal disorder. His Service Dog Echuka is trained to pick up dropped items and prevent him from getting hurt. But service dog fraud is making it difficult to keep them together. "In the last few years, the questions and the looks I get have radically changed," Peter says. "Now wherever I go, I see fraudulent service dogs. I have been kicked out of businesses because employees think I'm an impostor." Service dogs are more than a vest purchased for a few dollars online. They require years of expert training to perform specific commands and provide calm, reliable assistance to people with disabilities--including U.S. veterans injured while fighting for this country.